The locals here in Aruba have their own way of life even though the island is bustling with tourists. Over the past nine years that we've been coming here, we have learned to respect many of their customs. 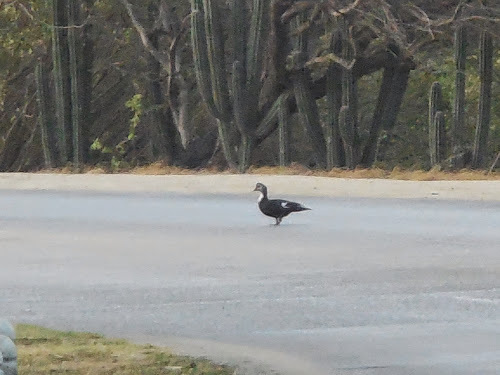 Some, however, are a little hard to swallow.Like the morning I took this photo.On my way to the beach for my morning walk, I spotted him crossing the road, snapping this pic.Upon my return to the resort, I saw one of the locals walk by hurriedly, carrying the duck.He planned on cooking him for supper. However, it is comforting to know that it will be used to feed a family. the photo didn't load for me. Yep.... people have to eat. Cute duck! Wow, that is sad! Have a happy day and weekend ahead! Sometimes it's better not to know what's going on. That's indeed sad, but yes...people have to eat, too. Well....at least he has been captured for posterity in your photo! Beautiful click! Have a good weekend! no different than eating a cow or pig or chicken except they don't have access to all of those.. Probably not much different than seeing a chicken on a farm, then having chicken for dinner. Or beef. or Pork. If anything, that duck had a much nicer life than the animals that supply our food.